Banzai’s mission is to connect professionals to high-quality, educational B2B marketing events. 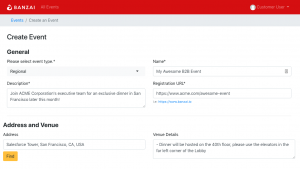 This week, we’re excited to announce a major product release that will give marketing leaders the power to launch their own events on their own time. Here is a brief breakdown of what to expect with the latest Banzai update. Whether it’s 2:00 p.m. or 2:00 a.m., you can now set up your next event(s) on your own schedule. Rather than checking in with an account manager, you can set up new events directly in the Banzai app. You’ll have full control over the details and the ability to modify them at any time. To maximize the likelihood of hosting a successful event, it’s important to begin inviting guests early. The new Banzai app gives you full control and full visibility into your outreach campaigns, helping you kick them off as soon as you create an event You can even upload your own targeted outreach and suppression lists to ensure the right people fill your next event. Your team members might not always work on the same events together. The new Banzai app allows you to add as many onsite contacts as you’d like and associate them with specific events, ensuring that registrants are directed to the right person if they have any questions about the event. Your events may not always have the same target audience. 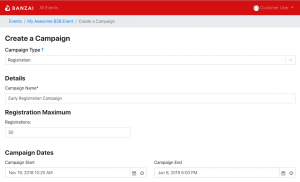 The new Banzai app allows you to create and store various audience profiles that you can assign as-needed to each of your campaigns. This gives you more control over defining who you want at each event, maximizing the chances that your event is filled with qualified leads. This update is just one step towards giving marketers all the tools they need to host successful events. Stay tuned for some big improvements over the next few months and happy planning!